(Bloomberg) -- Japan’s emperor should hold hands with women forced to work in the country’s military brothels and make a personal apology if Tokyo wants to end the decades-old dispute, South Korea’s top lawmaker said. The Japanese prime minister’s office didn’t immediately respond Friday to a request for comment on Moon’s remarks. The speaker’s comments underscore the widening divide between the neighbors, whose ties have sunk to one of their lowest points in more than half a century. The direct challenge to the emperor -- a revered figure, whose father was once considered a living god -- risked further angering Japan. While Akihito offered his “deepest regret” in 1990 for Japan’s colonization of the peninsula, many Koreans argue the country has failed to properly atone for specific wrongdoings, especially forcing local women to serve as “comfort women” in military brothels. Former South Korean President Lee Myung-bak outraged Japan in 2012 when he demanded a fuller apology as a condition for an imperial visit. The dispute reemerged after President Moon Jae-in was elected in 2017 and moved to undo the comfort women pact his predecessor reached with Japanese Prime Minister Shinzo Abe. After the death of comfort woman-turned-campaigner Kim Bok-dong last month, Moon vowed to do everything in his power to “correct the history” for the 23 surviving victims. In the interview, Moon Hee-sang said the “most sincere apologies” and compensation fund Abe offered comfort women in the December 2015 deal fell short of the sort of personal contrition German leaders have shown for their own country’s wartime atrocities. More than 90 percent of South Koreans believed that Japan still needed to apologize over the comfort women issue, according to a joint survey of both countries published by the Seoul-based Hankook Daily and Tokyo-based Yomiuri newspaper in July. That compared with less than 8 percent of Japanese who said another statement was necessary. In 2001, Akihito told reporters that he felt affinity with Korea because one of his ancestors was said to have married a Korean princess. The 85-year-old monarch is due to cede the throne to Crown Prince Naruhito in May, after saying his declining health had made it difficult to carry out his duties. Moon Hee-sang, 73, has long been a fixture in progressive South Korean political circles and served as a top aide to the current president’s mentor. In July, he was elected speaker of the 300-seat National Assembly, a position of ceremonial rank second only to the president. The pair are not related. 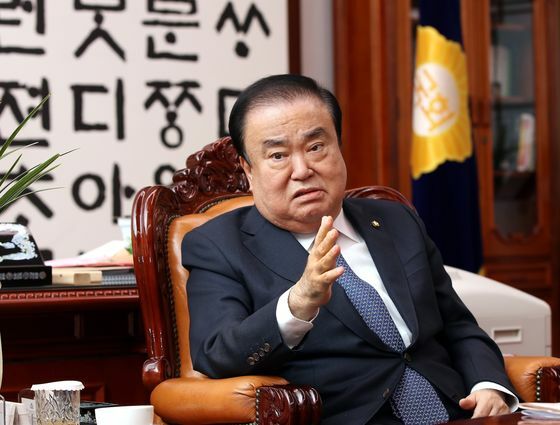 The speaker will likely be asked about South Korea-Japan ties next week, when he’s slated to lead a multiparty delegation to Washington to meet top U.S. officials including American counterpart Nancy Pelosi. The two sides are also expected to discuss U.S. President Donald Trump’s next meeting with North Korean leader Kim Jong Un later this month in Vietnam. Moon Hee-sang described the summit as a “great opportunity that arrives once in a thousand years” to establish peace on the peninsula, which been in a state of unresolved war since 1950. Reduced hostilities between the two Koreas would also improve ties with Japan, he said. The speaker credited Moon Jae-in with bringing Trump and Kim to the negotiating table.